Our Williamsburg VA bed and breakfast boasts a relaxing environment while providing you with modern amenities you would expect to find in hotels. Each suite and deluxe room includes a king canopy bed, fireplace, cable TV/DVD with a variety of movie channels, refrigerator, A/C, hairdryer, and iron/ironing board. Each bathroom includes a bath tub and shower. 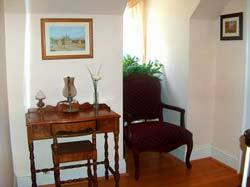 There is free wireless Internet (WIFI) throughout our Colonial Williamsburg VA Bed and Breakfast Inn as well. 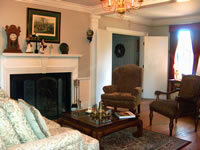 A full delicious breakfast is served each morning by the fireplace in the dining room. You can also enjoy refreshments which are available throughout the day and relax by the fireplace in the living room or sit outside on the deck. 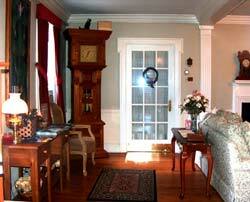 Our Inn has books, DVD’s and games available for your enjoyment. Forgot something? Let us know and we can provide you with a complimentary travel kit. Gift Certificates are available and make a great gift. Please call us to place your order. View our Availability Calendar for current special room rates.